Central idea: Christ is the living and incarnate Word of God. Doctrine: God inspires both the human authors of the written Word of God and its readers. Practical application: Reading the written Word of God. To view Lectionary 69, click here. Judaism can be said to be a religion of the Book, that is, the Old Testament, because it is their law, their history, their poetry, their wisdom, and their prophesy. The Mosaic Law as found in the Pentateuch was the guide for how Jews were to live. They could understandably be emotional: this all-day reading must have made them realize all that they had lost, all that they failed to do, and their own infidelity. Even though our lives involve suffering (this world is a vale of tears), and we may be punished for our sins (the natural consequences of doing wrong), and need to do penance (which we undertake), true religion is really God’s desire to make us supremely happy through his friendship and his gifts. The words of the Sacred Scriptures are true, instructive, and give joy. Even more, the Word of God, Jesus Christ, is perfect, refreshing, trustworthy, enlightening, right, joy-imparting, clear, pure, enduring, true, and just. Paul teaches the doctrine that the Church is the Body of Christ, who is its head. Every part of the body is vital. Each part has something to contribute. The most obvious question one can ask himself is, what gift am I in this Body of Christ? Whether it seems humble or important, whatever God gives us to be and to do is the best thing for us. 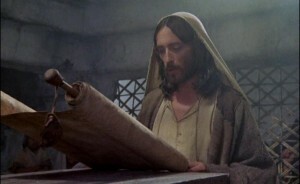 In the prologue of his Gospel, Luke writes of “the events that have been fulfilled among us” and “the teachings you have received,” in other words, what Jesus did and taught. Luke identifies the authentic sources of his narrative: “those who were eyewitnesses from the beginning and ministers of the word,” that is, the apostles and disciples. The content of his narrative is what we could call Sacred Tradition, the truth that these witnesses “have handed . . . down to us,” teachings we have received. The second part of the gospel reading shows God’s mercy. When Jesus returned in the power of the Spirit to his hometown, he attended the synagogue on the Sabbath as was his custom, stood up, was given the scroll of the prophet Isaiah, unrolled it, and read the passage about the merciful Spirit-led messiah. The messiah was to come for the benefit of the poor, captives, the blind, and the oppressed. And then, in one of the most dramatic moments imaginable, he sat down to teach and said, “Today this Scripture passage is fulfilled in your hearing.” In other words, he declared that he was that man. In the prologue to his Gospel, St. Luke explains his motivation for writing, the authenticity of his sources, and how he organized his work. Dei Verbum, the Vatican II document on Divine Revelation, teaches that, “To compose the sacred books, God chose certain men who, all the while he employed them in this task, made full use of their own faculties and powers so that, though he acted in them and by them, it was as true authors that they consigned to writing whatever he wanted written, and no more” (DV 11, quoted in CCC 106). In today’s Gospel reading we can see both the human and the divine side of the composition of the Scriptures. This is why Jesus’ humanity was a sacrament, “that is, the sign and instrument, of his divinity and of the salvation he brings: what was visible in his earthly life leads to the invisible mystery of his divine sonship and redemptive mission” (CCC 515). Thus, the Word of God is the person of Christ. Through the power of the Holy Spirit, Christ is alive in the living words of Scripture, something accomplished through the agency of divinely inspired human authors. Through the same power of the Holy Spirit, we who read these writing can find Christ, the Word of God, in this word of God. We should read the Scriptures as books inspired by God that teach about God and how we should live our lives. We should also ask for God’s grace to interpret what we read. God did not just inspire the human writers. He will also give us inspiration so we can understand it and apply it fruitfully. If we attend Mass daily, we can follow the cycles of readings provided by the Lectionary. The use of a missal or other aid can make our listening more fruitful. Five or ten minutes each day will make it possible to read the entire New Testament easily at least twice each year.